I sold my first book!! It's called Settling the Score and comes out in April 2013. Yep, that's the big news around here. It took me more years than most but the journey was worth it. I met a lot of fascinating people, all of whom have their own story to tell. I asked a few of them if they would share these stories of their own first sales. Here my published friends were congratulating me and telling me to enjoy the feeling because nothing feels as great as the “first” book. Meanwhile, I had to remind myself to breathe. I was so terrified I wrote the option book in 6 weeks and sent it in as fast as I could so that when the dismal news came from the editor I would get it over with fast. Yes, I’m the kind that rips the bandage off in one fell swoop. Out of that terror came “A Wanted Man”, my first Booklist starred review book and contracts for five more books. To this day I am still slightly terrified when someone tells me they have read my books. I brace myself and say, “I hope you liked it.” Thankfully, they usually do. Nancy now puts her fear and terror into cozy mystery series. 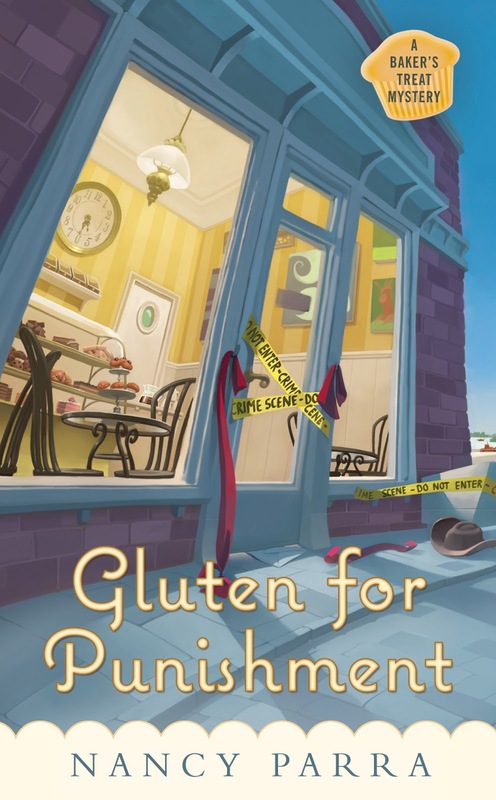 “Gluten for Punishment”, Berkley Prime Crime will be out May 7, 2013 and is available for preorder. Thanks for hosting me, Jacqui!! Must be all down hill from here? Or are there more mountains to climb?